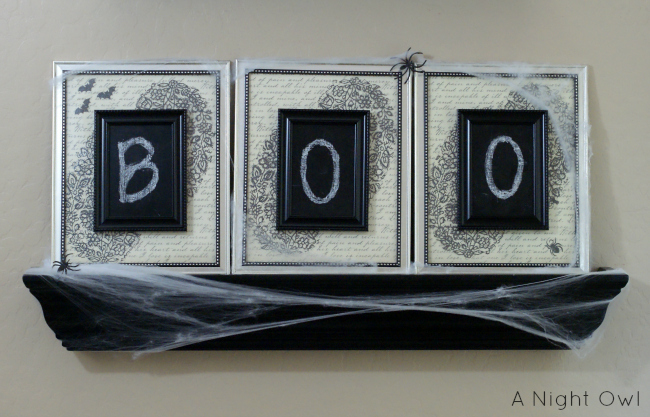 I shared with you our Fall Mantel earlier this week, but now that it’s October, it’s time to update for Halloween! 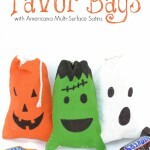 I’m part of a fabulous Halloween craft campaign where I received a box full of Martha Stewart Crafts! Just about anything you could think of; her amazing craft paints, new line of glass paints, chalkboard paint, adhesive silkscreens, paintable plastic, tons of stencils and paint brushes and handled squeegees. 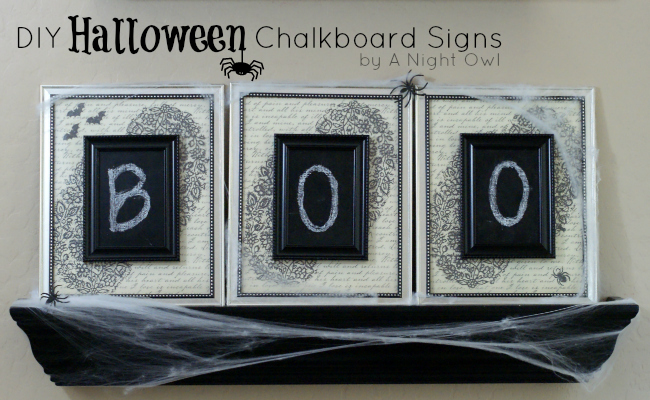 Now you know I love chalkboard paint and projects that are interchangeable, so I set out to make DIY Halloween Chalkboard signs, that can be updated based on the occasion! 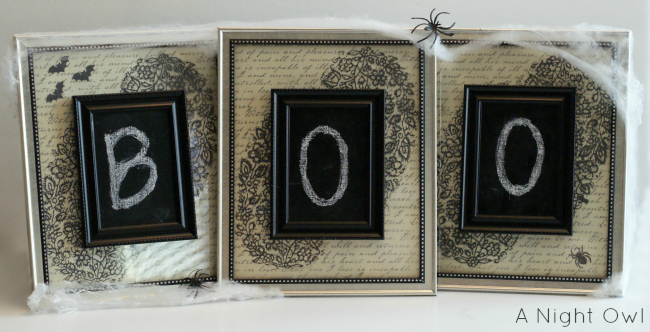 Make three 3×5 frames into mini chalkboards. 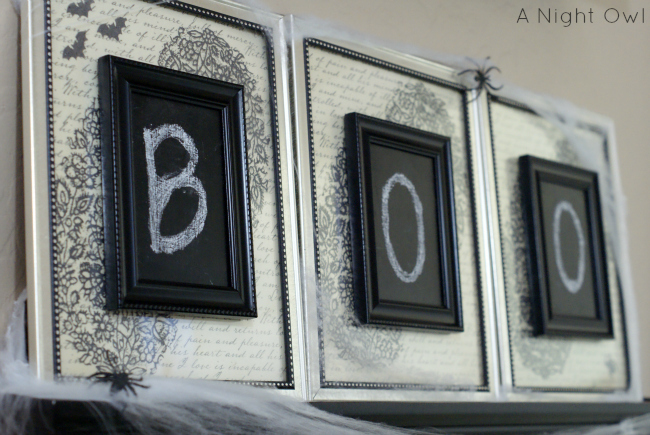 I simply took the glass out of the frames and painted them with Martha Stewart Crafts Multi-Surface Chalkboard Paint. After three coats and waiting 24 hours, I seasoned the chalkboards with regular chalk then wrote the letters “B-O-O” on them. Once I placed the glass back into the frame, I took the stand on the back of the frames off so that they could be adhered flush to the larger frames. Create interchangeable decorative background. 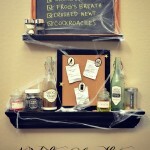 I used the Martha Stewart Crafts Adhesive Paisley Silkscreens to create visual interest behind the mini chalkboards. 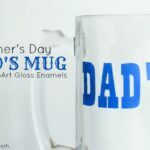 Now these silkscreens and paint could be used directly on glass; however, I chose to use the Martha Stewart Crafts Paintable Plastic so that the backgrounds could be changed based on the occasion. I simply placed the adhesive silkscreen where I wanted on the plastic and used the Martha Stewart Crafts Handled Squeegees to apply Martha Stewart Crafts Multi-Surface Satin Paint in Arrowhead. I subsequently added a few more affects. After the paisley design dried, I lightly brushed Martha Stewart Crafts Multi-Surface Glitter Paint in Obsidian over the the design to add a little sparkle. Who doesn’t love that? 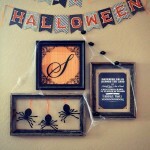 I then added a few bats and a spider to two of the pages with the Martha Stewart Crafts Adhesive Stencils. Assemble components and adhere mini chalkboards. I layered scrapbook paper and the paintable plastic with designs and inserted into the 8×10 frames. Then I used both hot glue (for speed) and E6000 (to be sure that the chalkboards stuck to the glass) to adhere the mini chalkboards to the larger frames. And you’re done! This may seem like a lot of steps, but really the Martha Stewart Crafts line was quite easy to use! I was so happy with the results; I can’t wait to use the adhesive silkscreens for other projects. And you know that you will see these frames again! It will be fun to see how I can interchange them and what else they can be used for! And here you have them. All set on the lower portion of our faux mantel. Now just to work on the top! It was such a fun project with amazing supplies, I hope you enjoyed the step-by-step and that you’ll go snag some of your very own Martha Stewart Crafts as well! You can check out this awesome line of Plaid Crafts on Facebook, Twitter, and Pinterest! I wrote this post as part of a paid campaign with Plaid Martha Stewart and Blueprint Social. However, the opinions in this post are my own. Check out other projects from this campaign! Wow those are so cool! I love the whole entire look. Fantastic job. I never would have thought to use those stencils like that! Oh, SUPER CUTE, Kimberly! I absolutely love working with the Martha stencils!! This is lovely! I use Martha Stewart’s craft supplies all the time, love them! These are awesome girl! Great job as always! These are the coolest! 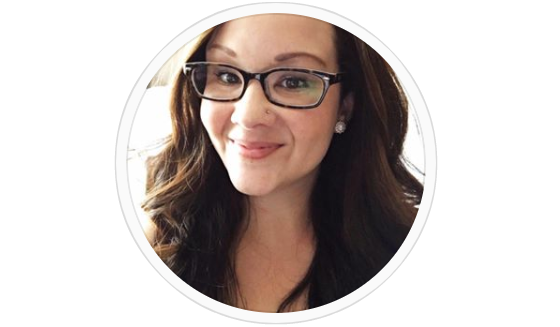 I pinned to so I can remember to give it a try! Thank you! I really need some more fall items on my mantel! I love the mini chalkboards! Oh Kimberly what a cute display!! I love that you stenciled on the glass. So smart! Well I know what I need to go make now.. haha! Kimberly!! This is gorgeous! Oh my gosh! I love love LOVE it!! What a great idea, too!! I love it, they look great! Thanks for sharing at The Fun In Functional! That is SO cute!! I love holiday decorating but am not so good at it. Pinning this! What a cute idea. I love this, big fan of Martha Stewart products 🙂 Thanks for the inspiration! I love how light this project feels and the shabby look of it. I have yet to try this amazing chalkboard paint I keep hearing so much about. If you get a chance I would love for you to come link up your project at my Pin Party. I just love this idea! 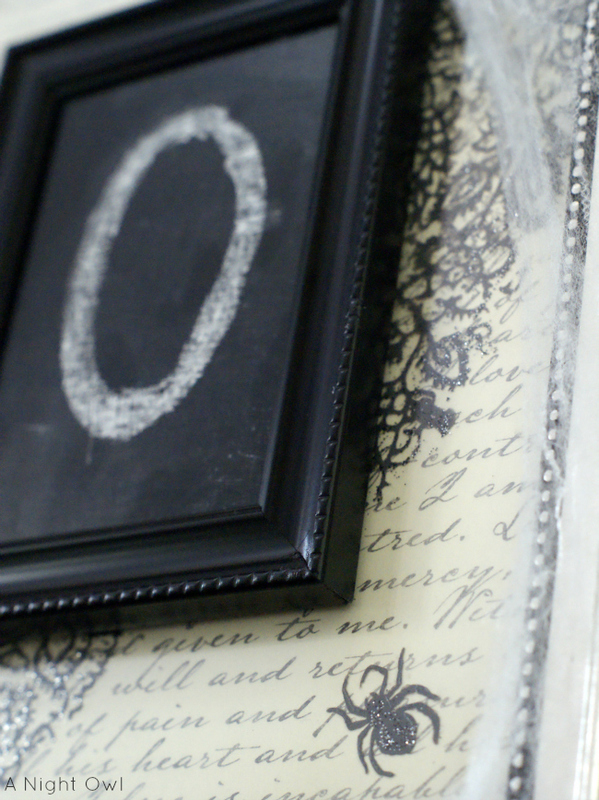 Chalkboard paint is the absolute best! !